Looking for a Used CX-3 in your area? CarGurus has 4,917 nationwide CX-3 listings starting at $11,500. Automakers are thrilled that compact crossovers are all the rage. Their next plan? Grow the subcompact crossover market following the same basic game plan. Mazda’s exciting new 2016 CX-3 is one of the best-looking new vehicles in any class, and it may just become a leader in the new cute-ute segment. The 2016 Mazda CX-3 should be a familiar sight to any Mazda fan. 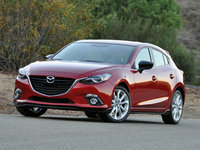 The 5-door raised hatchback melds the popular Mazda3 and CX-5’s looks and scales things down a bit. Despite being a smallish vehicle, in person the CX-3 looks tough and has presence. The Kodo “Soul of Motion” design theme first used on the 2013 CX-5 has aged very well and is on full display in this new model. Up front, the prominent nose with its upright grille not only meets European pedestrian safety requirements, it also looks bold. Headlights are sleek and similar in many ways to the new Miata’s, and the fog lights follow today’s vertical trend. Overall, the CX-3 looks very impressive from the front. Along the sides, Mazda uses visual cues to tell us this is an all-wheel-drive (AWD) crossover, rather than a hatchback. Fenders trimmed in black plastic imply all-road capability. The roof arcs back from the steeply raked windshield, ending at the rear hatch in a winglet. The CX-3 looks good from all angles, but the rear may be its best view. The small rear window terminates into a hatch we all recognize as Mazda’s. At the bottom of the bumper, more black plastic reminds us this is an all-weather machine. Twin pipes finish the look nicely. The drivetrain of the 2016 CX-3 will use Mazda’s 2.0-liter SkyActiv 4-cylinder engine. In 2015 models, that engine produces 155 hp, but the CX-3 returns 146 hp and 146 lb-ft of torque. Honda’s planned vehicle in this segment will use a smaller 1.8-liter four. The 2.0-liter Mazda engine may be enough for most drivers—much will depend on its gearing. The great news is that Mazda will not move to a continuously variable transmission (CVT), which most drivers do not prefer, but will use its 6-speed automatic (no manual transmission is available for the U.S.-market CX-3). Thanks to that 6-speed's gearing, the CX-3's 146 hp makes for a quick getaway. True to its rugged looks, part-time AWD is available on certain trims. The CX-3 comes in just under the EPA estimates for the current Mazda3 with a similar drivetrain. A 2-wheel-drive CX-3 will achieve 29 mpg city/35 highway, while AWD models deliver 27/32. Why lower numbers than the Mazda3's? Simply because lower, longer vehicles of similar weight get better mileage on the highway. Inside, the 2016 Mazda CX-3 looks very much like a slightly smaller Mazda3. That is to say, superb. The infotainment screen protrudes from the dash, and Mazda's fantastic interface features an easy-to-use rotary knob and a small volume/audio button—a combination that works very well. There's very little difference between this Mazda setup and the one in the Audi A3. Top trims will feature two-tone seats that look very sharp. The 2016 Mazda CX-3 is more 2+2 than the 5-passenger Mazda3, with adult front passengers leaving little room in back for three adults. Cargo capacity with rear seats up is a modest 12.4 cubic feet. That said, many younger urban buyers will find the size and shape of the CX-3 ideal. Its rear seats fold, revealing 44.5 cubic feet of cargo space—enough for a surprising amount of storage for things like bicycles and snowboards. Safety has become one of Mazda’s strong points. It will be a very big surprise if the Mazda CX-3 is not an Insurance Institute for Highway Safety Top Safety Pick+. Mazda has announced that a radar-based forward-collision prevention system will be available. The new subcompact crossover market will almost certainly grow by leaps and bounds over the next 5 years. The 2016 Mazda CX-3 looks to be one of the best affordable models coming to this new segment. What's your take on the 2016 Mazda CX-3? NutritionGuru I love almost everything about this new entry from Mazda. The only thing I'm bummed about, is even in the top level trim, it does not look like you can get power seats or lumbar adjustment. Any info on this, or did I miss something? Users ranked 2016 Mazda CX-3 against other cars which they drove/owned. Each ranking was based on 9 categories. Here is the summary of top rankings. 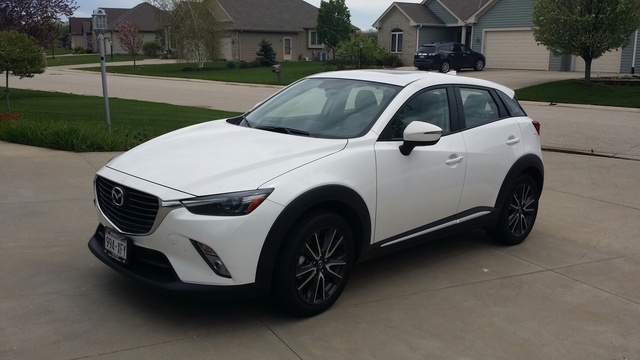 Have you driven a 2016 Mazda CX-3? does CarGurus keep a archive of past cars sold say within the last 60 days? I have twice contacted a private seller with an offer and she never gets back to me with a no answer or counter offer? Doesn't cargur u monitor this?